The iconic Japanese, cone-shaped, Fujisan was officially recognized as a World Heritage Site at the annual UNESCO conference held in Cambodia, a registration which some in Japan have worked toward for almost a decade. Mt Fuji, south-west of Tokyo, Japan’s highest mountain at 3,776m (12,460 ft) last erupted 300years ago. It is featured prominently in historic Japanese art work, including wood blocks prints. It is also one of the traditional “Three Holy Mountains” – along with Mount Tate and Mount Haku, both in central Japan. 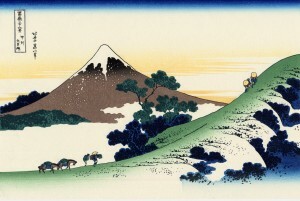 Unesco said Mount Fuji had “inspired artists and poets and had been the object of pilgrimage for centuries”. Unesco documents singled out a series of wood block prints by Katsushika Hokusai, the Thirty-Six Views of Mount Fuji, saying they “had a profound impact on Western art in the 19th century and allowed the form of Fujisan to become widely known as the symbol of ‘Oriental’ Japan”.